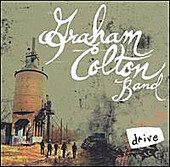 With plenty of punch, snappy hooks, and a likeable, albeit radio-friendly production value to it, the Graham Colton Band deliver Drive, a crossover pop-rock record that could find itself played on both adult alternative and modern rock radio formats. It is within this wide spectrum that the Graham Colton Band thrives, writing sing-along, crunchy pop-rock songs without a hair out of place. From chunky bass to clean guitars, through steady drumbeats, they may play it safe, but they keep focused on the song, which cross each other out and make you judge the music entirely on the music. Good vocals, sing-able lyrics, and a hit or two on the album, this is a band that could, with good support from the label, find itself on the top of the charts. What's more, music fans will listen and say, "finally a decent band on the radio who can write a song, but still sound completely commercial without being annoyingly so". I'll give it a C+.